It has been one month since the 9.0 magnitude earthquake struck the North-eastern part of Japan. Tracking back the calendar, I can almost vividly remember each and every day that flashed past like lightning. After working for five consecutive days after the earthquake, I left Japan for Korea, then to Singapore. Met up with Peter Draw and discussed about our plans. Before we knew it, we had the blue print sketched out and we flew to Japan soon after. This was when Project Yume started, as we began broadening our contacts, visiting schools and evacuation centres. The first phase of our project has come to an end, as we gear up for the next phase to come in a few weeks’ time. 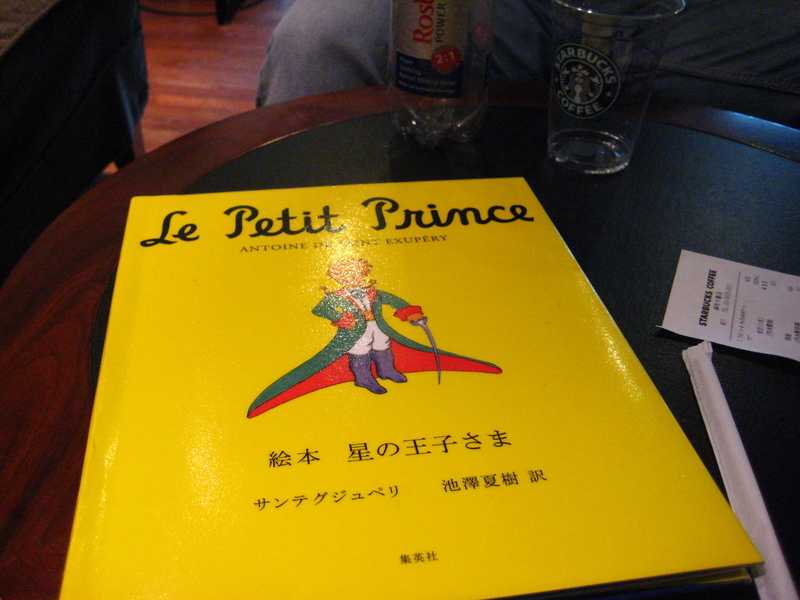 Yesterday, I was at Starbucks in Azabu Jyuban where I came across “Le Petit Prince” at a small library corner in the shop. I picked it up and started reading. It was a simplified version in Japanese for children, so it was a rather easy read. To be honest, I had hardly read this book before, and considering I remember almost nothing of the contents, it felt as if I was reading the book for the first time. It being such a classic among children and adults lived up to its reputation as I was truly touched by the innocence of the ideas brought up in the book. As I flipped through the pages, the simple lines in the book caught my attention and struck me as profound and important lessons we can learn, especially after this earthquake, and for my project. The book started with a foreword by the author, Saint Exupery, “All adults were once children (though most adults have long forgotten this fact)” Children usually act on impulse, based on emotions and instincts, whereas adults often think and sometimes think too much before we act. I am not saying that which is better, and in fact I must agree that in this reality, it would be better for us think twice before acting. However, all adults were once children, and so all adults used to act on impulse and instinct too. As we grow up, we build more and more layers of wall between us and others, between what we feel and how we act. We start to think more than we feel. Should I say it is the natural evolution of human beings to change for the better, therefore children mature and grow into adults? Or should I say that adults slowly forget their natural selves and instincts, therefore children degenerate into adults? First, I must admit that numbers are important in making something tangible and easily understandable. It would be a chaotic world if we live in a world without numbers. Perhaps the world has changed such that numbers have gained such importance that everything around is measured in numbers- value, height, weight etc. However, we must not forget the most important things are non-measurable by numbers. The inner values, beauty and details are the most accurate yardsticks of something or someone. After this Japan disaster, television news are filled with reports on the number of casualties, the amount of destruction, the amount of money lost and required to rebuild the cities, the amount of money a certain organization or country has donated. Yes, it is important to us, but what lies beneath all these, but value above all these, are the grievances, tragedies of the casualties and damages, as well as the motivation and spirit behind these people who help. A multi-billionaire who draws out 1 million dollars from his pocket, compared with a group of normal civilians who get together a fund-raising event to raise 1000 dollars. Which is a more touching story? “I have one stalk of flower and three volcanoes in my planet. I water my flower and clean my volcanoes. What do you do to your 500 million planets and stars?” The little prince asked the astronomer. Indeed, as we are blinded by all the news of the numbers and amounts lost in this disaster, we should not forget to listen to the stories behind each and every lost family member and relative, behind each and every tragedy. Looking at the big picture is important, but we should not neglect the little stories that make up the whole jigsaw puzzle. We should not cry over the billions of dollars lost in this disaster. Every family had worked so hard over the past decades to accumulate a small fortune and build a house. Every fish caught and every seed planted resulted in a house, a fishing boat and a small farm, that are all now washed away. This is what we should cry over. Even if we cannot help the tens of thousands of people who have lost their homes, we should help the tens of people we can help. One month has passed since the earthquake. Nobody knows what awaits us after this, but let’s start picking ourselves up. Dennis this is probably the most profound piece i read in your blog (so far) ! I think it’s wonderful what you’re doing to help those in need, and starting a project for the kids. I’m so sorry but can you explain a little more in detail, what exactly Project Yume does? I feel so bad for the thousands of people who’ve lost everything in this disaster, and I really want to help. Hope things are settling down over there! Hi Bella! It’s been a long time since I got a comment on this blog lol. This is why i love to read your blog, i hope you blog more in the future. By the way, I’m sorry but do we know each other?